The annual University Court event was the first for new Vice-Chancellor Professor David Phoenix, who officially became LSBU's Chief Executive in January 2014. Established by the University's Board of Governors, the Court supports the University in the development and achievement of its objectives and cultivates engagement with external stakeholders. The University Court plays an important advisory role in the development of the University through its large and varied membership of prominent and distinguished individuals. Members are able to become involved in the University and, where possible, pass on their skills and knowledge to students, for example by delivering guest lectures or taking seminar groups. Attended by local Rt Hon Simon Hughes, Southwark's MP, the event was an opportunity for LSBU to share latest developments around campus and showcase the high calibre of LSBU's student and graduate entrepreneurs. Amongst the entrepreneurs showcasing their business at the event was recent BSc (Hons) Product Design graduate Arina Sprynz. Arina launched her business Rinz Sound with help from the LSBU Enterprise Associate Scheme. Arina's business specialises in eco-conscious speakers made from recycled glass – the world's first speakers of their kind. Student entrepreneur Clay Niccum also showcased his business Cheeky By Nature LTD, which specialises in healthy baked goods. 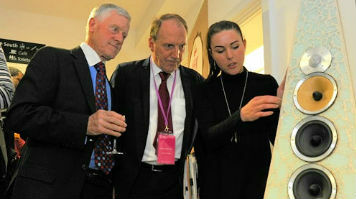 The University Court event took place in the Clarence Centre for Enterprise and Innovation, which offers flexible office space to small businesses, as well as a permanent home to the University's Enterprise team. The Centre also presents a new platform to strengthen support for local businesses – a hub where businesses can build networks and benefit from each other's experience. Find out more about enterprise at LSBU and read about membership of LSBU's University Court.